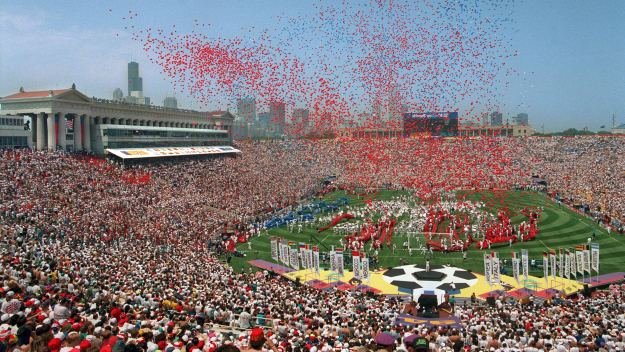 Soldier Field during World Cup 1994. Photo courtesy of Chris Wilkins, AFP/Getty Images. On Monday afternoon at the Freedom Tower in New York, the United States, Canadian and Mexican football associations held a joint-press conference to announce their bid to host the 2026 FIFA World Cup. The bid states that 60 of the 80 matches at the tournament will be held in the US with Canada and Mexico each getting 10. All games from the quarterfinals and onward would be in the US. “This is a milestone day for US Soccer and for CONCACAF,” USSF president Sunil Gulati said. “We gave careful consideration to the prospect of bidding for the 2026 FIFA World Cup, and ultimately feel strongly this is the right thing for our region and for our sport. The US and Mexico have both hosted men’s World Cups before with the most recent one being in the US in 1994. The 1994 World Cup boasts the record for the best average attendance with the 1970 World Cup in Mexico sitting at fourth-best. The 2026 World Cup will be the first edition of the tournament with the expanded 48-team format. With North America’s infrastructure, and in particular the sporting venues, the three nations provide a strong bid. In response to anticipated criticism, Gulati stated that US President Donald Trump was “fully supportive and encouraged” the US Soccer Federation to pursue the bid. He also mentioned that Trump was “especially pleased” to learn Mexico would be involved. Mexico could become the first nation to host a World Cup three times (previously in 1970 and 1986). Graphic courtesy of Wikipedia. There are many more hurdles that will need to be crossed before anything could even be set in stone (such as the actual vote for the host country(s)) with one being whether or not all three nations would get automatic qualifying bids. Canadian Soccer President Victor Montagliani believes that all nations deserve automatic bids. Canada has only qualified for one World Cup and that was in 1986. Nations have until December 2018 to submit all bids. There is then a 15 month evaluation period and the host(s) will be chosen in May 2020. This is the first official bid for this edition of the tournament with Colombia being the only nation with a confirmed interest in bidding. Another bid that could be expected is a joint-bid between African nations.